This posting is a re-post which I inadvertently unpublished. Here it is again for those of you who are looking for a refreshing and tasty salad idea. Lahanosalata… Greek Coleslaw Salad all dressed up! One of the things that always amuses me whenever I see it on a menu or in an advertisement is the phrase “Greek salad”. Now, Greek salad is commonly understood as either one of two things: a combination of tomatoes, cucumbers, onion and feta cheese (and sometimes peppers), or the same aforementioned ingredients with the addition of lettuce. The truth is, Greeks consume more vegetables (both raw and cooked) than all other Europeans, and the numerous “salads” one can find throughout the various regions of Greece are as varied as the terrain. The one thing, though, that never makes it into a “Greek salad” in Greece is lettuce! 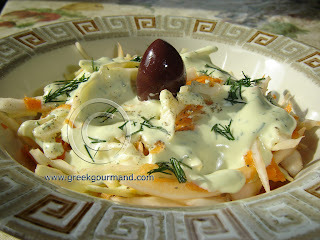 Whenever I visit my aunt in Athens, I always look forward to her Lahanosalata. Although North Americans are familiar with coleslaw as a side for fish and chips or pulled pork, few of us are aware that coleslaw salad was known to both the ancient Greeks and Romans, and although many regional variations exist today, the combination of shredded cabbage and carrot is as old as the hills. Of course, some things have changed - the colour of the carrot for instance. In ancient times, carrots were either white or purplish in colour. We have the Dutch to thank for the orange colour of present-day market carrots as they bred their national colour into the strain we commonly refer to as “carrots”. 1. Wash cabbage well and peel carrots. 2. Shred the cabbage finely with a sharp knife. Cabbage is a tough vegetable due to the density of its layered composition, so you may find it difficult/dangerous to achieve thin slices with a knife in which case you can use a mandoline. Once the cabbage is well shredded place in a large mixing bowl. 3. Shred the carrots into ribbons using a mandoline (or the large holes on a grater) and add to shredded cabbage. 4. Toss shredded cabbage and carrots well to ensure a good mixing. 5. In a food processor/blender, add all of the dressing ingredients (yogurt, olive oil, lemon juice, oregano, dill, salt and pepper) and blend together until smooth and creamy. 6. Pour dressing overtop of individual servings or mix well into the entire salad before serving. Your recipes look amazing! I just discovered your blog and I'm so excited. Thanks for doing it. Great dressing Sam. It's more for the cooler months but a window on what veggies us Greeks eat in the winter. A new dressing for me, so I'm definitely trying this one. It sounds wonderful. I should mention that I made an error in my initial posting of the recipe, such that it read 1/3 cup of lemon juice for the dressing. It is actually 1/4 cup of lemon juice for the dressing. I have since corrected the error in the main posting above. Sorry for any confusion. Thanks for stopping by my blog! I haven't had time to look all around your site yet, but I'm definitely interested! And thanks for the tip about the No.2 spaghetti - it's not in our regular grocery store, but if I find myself at a more upscale place, I'll look for it! I've never had a creamy version of lahanosalata, but it sounds really good. I'm going to try it! Lulu - Go for it! Let me know what you think. This dressing is new to me as well. Shall try this one as well. Ivy - please do, and let me know what you thought of it.